Special Legislative Concerns: education, small business, transportation, veterans, banking, agriculture. She was a member of the Kiwanis, St. Anne's Hospice Board of Directors, and the Winona Historical Society. She died of congestive heart failure at Lake Winona Manor in Winona, Minnesota. Her funeral was held on April 7, 2004 at St. Mary's Catholic Church in Winona, Minnesota. She was buried in Holy Trinity Cemetery in Rollingstone, Minnesota. Religion provided by her obituary. Xiong, Chao. 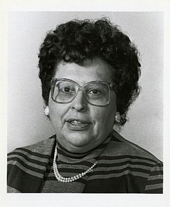 "Former Sen. Patricia Kronebusch, 77, Dies (Obituary)." Star Tribune, April 5, 2004, p. B3. "Kronebusch , Patricia L. (Obituary)." Saint Paul Pioneer Press, April 4, 2004, p. C10.